Nothing beats the taste of freshly picked ripened homegrown tomatoes which are, without a doubt, superior to store-bought produce. However, as the end of the season nears and temperatures start to decline there are invariably plenty of green tomatoes left on plants that didn’t quite make the cut. 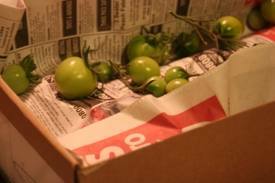 Cardboard method of ripening green tomatoes. What to do with all of those unripe tomatoes that were left on the plant, you must be pondering! These, too, will ripen over the next few months if stored properly. They won’t be as tasty or juicy as the ones you’ve been enjoying all season long, but they will be real tomatoes from your own garden, and still way better than anything you can buy in a supermarket from November through May. Contrary to popular belief, windowsills aren’t the best place for ripening tomatoes. If you’ve noticed, your tomatoes often start to ripen on the side opposite to the side exposed to sunlight although not all varieties show this nature. So, a good amount of light is not required for ripening, furthermore it is known to harden the fruits’ skin. On the other hand, temperature is an important factor. The warmer the temperature the quicker a tomato fruit will ripen. Hence, ripening can be slowed down by placing tomatoes in a cool area or sped up by placing in moderate warmth. Another factor that is crucial in the ripening of tomatoes is ethylene gas. Ethylene is actually naturally released by ripening fruits such as bananas, apples and tomatoes. So, placing a ripe banana or apple among green tomatoes helps speed up the ripening process. Creative use of a rack to ripen green tomatoes. 1. Jar method: Place a ripening banana along with your green tomatoes in a glass, ceramic or plastic jar. Do not overfill the jar, or the tomatoes might get bruised. Screw the lid tightly and leave it in a warm, semi-humid environment, out of direct sunlight. 2. Cardboard box method: Line a cardboard box with newspaper and place the green tomatoes on top in a single layer with a little space in between. Placing ripening bananas along is optional. Cover with another layer of newspaper and place the box out of direct sunlight, in a warm and low humid environment such as a basement, insulated garage, or enclosed porch. 3. Paper or plastic bag method: Put 5-10 green tomatoes in a paper or plastic bag with a ripening tomato, banana or apple and place in a warm, low-humid place. Punch in a few air circulation holes in each plastic bag being used. Paper bags are naturally semi-permeable (meaning they allow to an extent air to diffuse through them). 4. Hang the whole plant method: This method is useful at the end of the season when a frost is forecast as frost is damaging to tomatoes making them turn dark green and unable to ripen. Gently pull up the whole tomato plant and hang it upside down in a garage or cellar where temperatures remain above freezing. This method supposedly gives better tasting tomatoes than the other methods. Tomatoes ripen from the bottom up and the inside out, so don’t put tomatoes on a windowsill to ripen because they will only turn red, but not ripe. They will remain green inside. The best results are got when the tomatoes are already showing a yellow-orange tinge which indicates that they are ready to ripen. You can be successful with turning fully green tomatoes into ripe ones but they will take longer and may not be so flavorsome. It takes about 3-4 weeks for ripening at lower temperatures 10-15 deg. C (50-60 deg. F) whereas it can take just 2 weeks at 18-21 deg. C (65-70 deg. F). 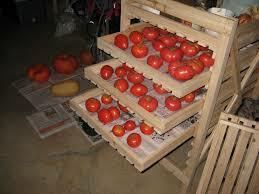 Diseased or damaged fruit is the biggest problem when ripening tomatoes indoors. Avoid piling them up to prevent and protect them from being bruised or squashed. Ensuring adequate air circulation will prevent molds from forming. Every day or two check up on them and remove anything suspect. Select only the very best tomatoes for ripening as any lower grade tomatoes may be suffering from a disease such as blight.